Make a meal of this with dolmades, olives, pita pockets, slow-roasted tomatoes, that sort of thing. 1 If the broad beans are fresh, remove them from their pods and drop them into a saucepan of lightly salted boiling water. Return water to the boil and cook for about 7 minutes, depending on their maturity. Drain and refresh with cold water until they feel cool. 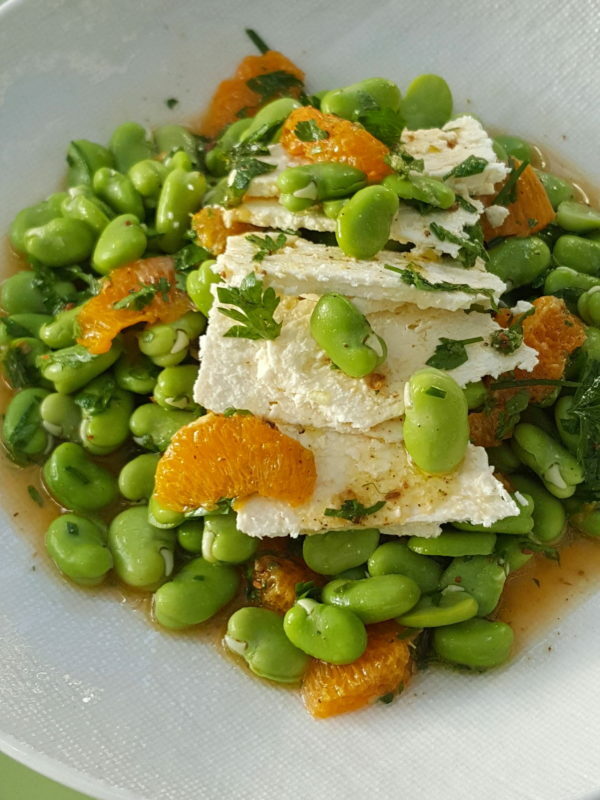 If using frozen broad beans, put them in a sieve and rinse off ice crystals under running hot water, then cook as for fresh, for about 3-5 minutes or until tender. Drain and refresh with cold water until they feel cool. Flick off the outer skins and discard. This is fiddly but necessary as the skins are tough, so make yourself comfortable and just get on with it. The beans can be prepared 1-2 hours ahead; keep covered and refrigerated. 2 Peel tangelos with a small serrated knife, then cut in between each part of the membrane to release the segments, letting them fall into a bowl. Pat feta dry with paper towels and slice. 3 Whisk oil, tangelo juice, salt, pepper, chilli and cumin together in a large bowl. 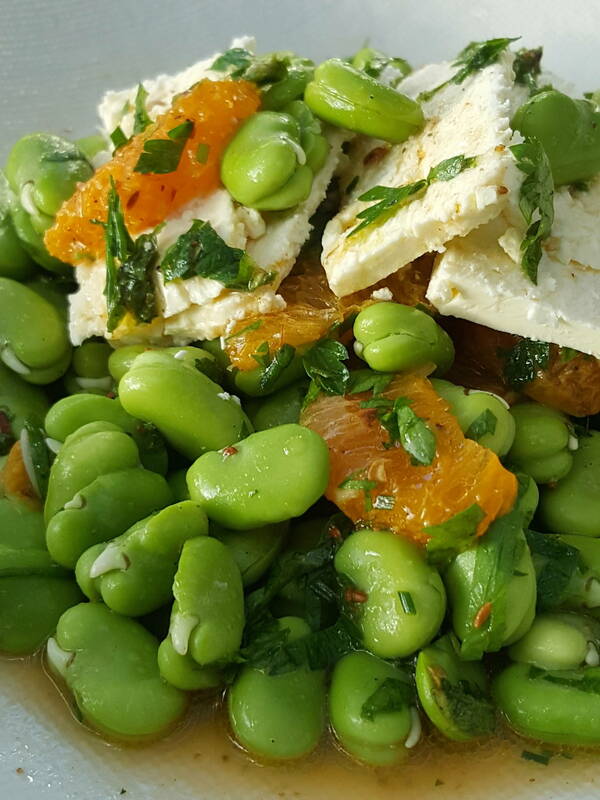 Add broad beans, parsley, chives and mint, and toss well. Add tangelo segments and toss again. 4 Transfer to a serving bowl, reserving any dressing in the bottom of the bowl. Arrange feta on top and drizzle with remaining dressing. Serve immediately. I love this salad with roast or barbecued chicken, but also with pork, lamb, turkey or duck, roasted or barbecued. But it is also lovely with pita pockets, olives, dolmades, slow-roasted tomatoes, that kind of thing, and for meat eaters, a slice of succulent ham off the bone will make a delicious accompaniment.